DOVER, Del. 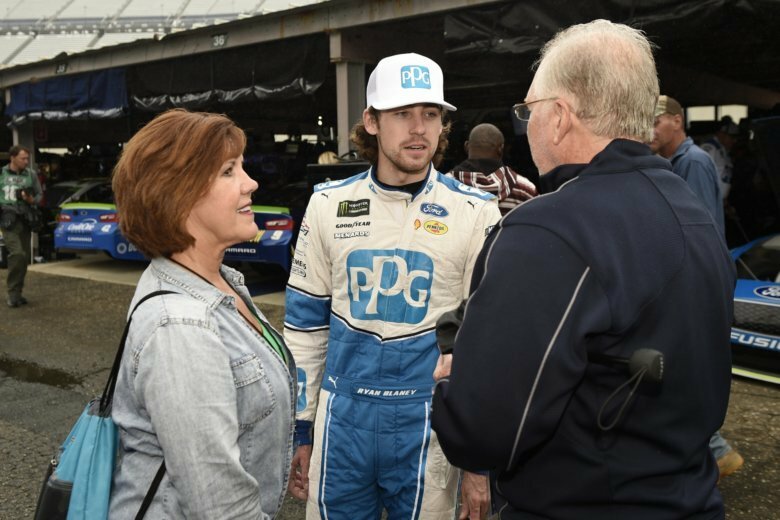 (AP) — Ryan Blaney kept the party rolling from his first win this season long enough to stimulate business at his favorite bar. He soaked in the celebration from his checkered flag on the roval at Charlotte. Now he hopes to stamp himself a contender in the next round of NASCAR’s playoffs. Blaney, one of NASCAR’s blossoming young stars, earned an automatic spot in the second round when he zipped past Jimmie Johnson and Martin Truex Jr. for the surprise win on the speedway and infield road course blend. The Team Penske driver got the last laugh at Charlotte. But even he is not convinced one win automatically made him a title contender along with former series champions Truex, Kyle Busch, Brad Keselowski and Kevin Harvick. The chase toward the title continues Sunday at Dover International Speedway. Talladega Superspeedway and Kansas Speedway also make up the races in the second round. The last four drivers standing after three rounds will race for the best finish at Homestead-Miami Speedway on Nov. 18 to be crowned the 2018 NASCAR Monster Energy Cup Series champion. Blaney is still in the mix. Stewart-Haas Racing holds four of the 12 spots: Harvick, Clint Bowyer, Kurt Busch and Aric Almirola. Team Penske is right behind SHR with Blaney, Joey Logano and Keselowski. Chase Elliott and Alex Bowman are in the field for Hendrick Motorsports. Truex (Furniture Row Racing), Kyle Busch (Joe Gibbs Racing) and Kyle Larson (Chip Ganassi Racing) make it 12. Kyle Busch and Harvick start 1-2 in Sunday’s race. There is some urgency for the non-Penske drivers to win or post a top-10 finish at Dover: Talladega is on deck and Keselowski and Logano have combined to win five of the last seven races at the superspeedway. Larson crashed out of the first Talladega race and finished 40th — the kind of result that will knock him from contention this time around. Here is a look at the round of 12 as it gets underway at Dover. The NASCAR season was dominated early by the Big Three of Harvick, Truex and Kyle Busch. It’s the Team Penske trio of Keselowski, Blaney and Logano. Team Penske drivers combined to win four of the last five Cup races and seemingly have a lock on the Talladega checkered flag. Logano’s only win this season was at Talladega. Penske, though, hasn’t had a driver win at Dover since Keselowski in 2012. A bit of luck was on Larson’s side at the roval. He was caught up in a late crash that seemed to wreck his odds of advancing in the playoffs. He had to bring his No. 42 Chevrolet down pit road twice under caution over the final six laps and limped to a 25th-place finish. Larson caught a break when a last-lap crash allowed him to make a pass and earn one playoff point — enough to tie him with Almirola and Johnson for 12th. Johnson, the seven-time champion, lost the tiebreaker and Almirola and Larson were alive. “Hopefully, that means something for us and we can take advantage of the opportunity we were put in last week and go out there and have a good rest of the playoffs and maybe make it to the Final Four,” Larson said. Larson is winless but has six runner-up finishes this season, including the playoff opener at Las Vegas. He topped the speed chart at practice Friday. Led by the Penske trio, Ford has seven drivers in the second round. “That’s huge and to have that many bullets still in the chamber right now to go out there and try to win a championship with one of them,” Logano said. Sports betting is legal in Delaware and this weekend fans at the track could bet on the race. They might want to put a few bucks down Sunday night on the winner of the race to win it all. The Dover playoff winner has won the Cup championship four times since 2009, and last year’s winner, Kyle Busch, was series runner-up.